Tree Trimming in Ottawa - Crowe Tree Service Inc. Trees are trimmed mostly for one of three reasons: safety, shape and appearance, and to maintain the health of the tree. Tree trimming, and pruning helps maintain a trees appearance and shape, although it is not advisable to try and shape trees away from their natural growth pattern. This may need several trims and may damage the tree, almost always permanently. Broken and dead branches fall off and can be a safety hazard if they are in close range of short structures like houses. Trees along roads with losing branches in Ottawa may obstruct drivers vision leading to accidents. Electricity line and telephone lines may be cut and destroyed by free-growing tree branches and it is the responsibility of the Ottawa company to handle the issue. Infected trees can be saved by pruning off affected branches and limbs. Trimming tree crowns help improve airflow which is beneficial for the health of the tree. Branches in contact with each other should be trimmed to avoid them falling unexpectedly. It may seem difficult to determine when the trees should be trimmed or pruned. 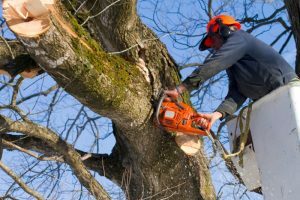 However, we have come up with tips that will help you have a range of when to trim trees around your home or neighborhood. Most deciduous trees in an urban setting benefit from frequent trimming after every 3 to 5 years. Exceptions are when the deciduous trees grow in close range of structures because they may drop branches on the roofs of homes, damaging property and harming people. Pine trees around the Ottawa area may need trimming every 5 to 7 years. However, it is important to check the tree health for a more frequent prune on its affected branches. Cedars should receive trimming every 3 to 5 years. Ornamental trees should be trimmed to the owner’s preference. It can be done either or yearly twice in a year. What is the right timing for trimming? It is highly dependent on the health condition and type of tree in question. Here the crown is reduced by pruning, although removing the tree is a preferred choice. Heavy trimming should be done yearly to cut back extending tips and leaving lead branches to lower the crown. Trees which have been topped can start in the process of first pruning and reduce the number of leader branches which seem to struggle for light. It should be done in a cycle of 2 years to restore and reclaim the tree shape and aesthetics. The lowest branches on conifers and some native trees in Ottawa are pruned off to stop them from struggling for light. Many confers in Ottawa tend to develop lower branches which struggle for sunlight and it is advisable to cut them down as often as they grow. Trees that grow in areas too small for their nature can be pruned formally to keep the aesthetics in check. Regular and professional trimming is required to maintain the desired shape. Trimming twice in a year is the optimum timing because it keeps outgrowing limbs in check.